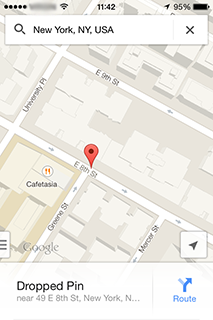 Want to share your location on iPhone but don't know how? Its easy with the iPhone, simply open the Google Maps app and you will see the blue dot indicating your current location. 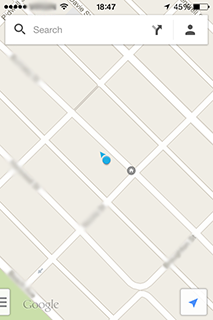 You will need to drop a pin to share your location. To do this simply hold your finger down on the area of the map you want to drop a pin on. Once you have dropped the pin you will notice the words "Dropped Pin" will show at the bottom of the screen, along with the address of the pin location. You need to tap on "Dropped Pin" to display the share options. 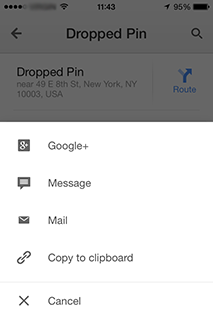 When you tap on "Dropped Pin" you will have the option to share by way of text message, email, through your Google+ account, or to simply copy it to the clipbord and save for later.